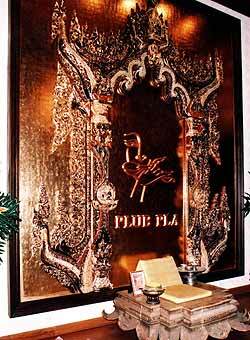 Plub Pla is a restaurant in the grounds of the well known Khum Khantoke tourist center. This a hustling mass of agog tourists, being shepherded towards the huge khantoke dinner salas. Be careful you are not trodden underfoot by hungry Hungarians and other tourists. However, do not follow the flag wavers, you are going to dine exclusively at the Thai restaurant in the grounds. 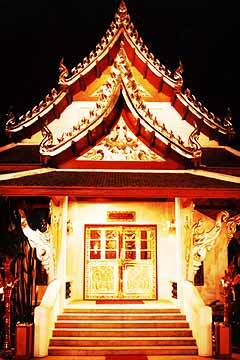 This is the brilliantly lit Plub Pla, which is to the right hand side of the Khum Khantoke compound. Take a look at the photograph of the exterior. This restaurant appears like a palace built in the grounds, and indeed, the translation of Plub Pla is ‘royal pavilion’. The interior is just as palatial, with the characteristic rhomboidal window shapes, heavy wood paneling and large ornate chandeliers. Even outside in the orchid garden, it is ‘over the top’ with orchids, fountains and enormous wood carvings on the walls. It could be nowhere else, other than Thailand. The menu echoes the traditional rhomboidal design as well and the first pages have information for those who are not au fait with Thai cuisine, explaining kitchen utensils and the various herbs used in a Thai kitchen. The first proper menu page covers seven appetizers (B. 60-120), with the Thai name given first in Thai script, then the Thai transliteration and finally an English language explanation, such as “Deep fried stuffing pork meat and prawn meat in chicken egg” which means more to the tyro Thai palate than “Plub Pla sord sie”! Herbed and spiced salads are next (B. 60-150) with a traditional larb plus many other favourites such as fried crispy catfish with mango salad or glass noodle salad with shrimp (yum woon sen goong sod), or the ubiquitous som tam papaya salad. There is a page of dips (B. 60-150) with most advising the diner that they are spicy. These are followed by seven soups (B. 60-80 for a single serve) and again cover the traditional items as gaeng liang and gaeng chued. There is a greater choice in the curries, with 11 items (B. 80-180) and covers duck, chicken, beef, prawn, salmon, pork and river fish. Again there are very traditional items such as salted egg and a hang lay curry (Northern pork with ginger). Finally there are fried and steamed dishes (B. 80-200) and desserts (B. 30-60). All the prices are ++ in hotel style. We began with spring rolls, which were very tightly wrapped (cigarette sized) and come with their own hot chilli sauce. These were very tasty, with sweet basil - but the sauce was hot. We followed with a deep-fried fish with fresh vegetables. This was pleasant, though the fish was a little dry for my taste. Another seafood dish was the spicy river prawns. These were served Thai style with the heads still on - this can be something of a shock to the less adventurous westerners! The prawns were also very spicy! Our next item was the traditional larb (spicy minced pork), served on a very traditional plate, with the raw vegetables. This was a very harsh curry and one that should be approached with caution by those not used to a full-on larb. By the way, the rice came in its own lidded porcelain bowl for each diner. A nice touch. Plub Pla impresses with the sheer ‘over the top’ nature of the building and its decor. It will leave any first-time tourist gasping. Whether dining indoors in the sumptuous hall, or dining outside surrounded by orchids, this is Thailand taken to the extreme edge. The food is also decidedly Thai, for a decidedly Thai palate and beautifully presented; however, there is no holding back on the spices for timorous westerners here. If you have overseas guests who appreciate chillies, then an ‘over the top’ evening at Plub Pla should be on the itinerary. A breathtaking evening, as was the food! Plub Pla, Khum Khantoke, Chiang Mai Business Park, 139 M4, Non Pakrun, Chiang Mai, telephone 053 304 121-3, fax 053 260 504, email [email protected] khumkhantoke .com, website www.khum khantoke.com. Open 11 a.m. till 11 p.m. Secure parking in the Khum Khantoke parking area.